Rat Pack Impersonators. 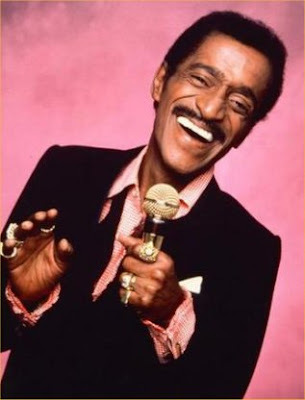 Sammy had an album titled Mr. Bojangles, and after his death, his wife Altovise launched a live stage show about Sammy's musical career, named after the song. But Mr. Bojangles, so associated with Sammy, was recorded by many diverse artists, including Bob Dylan, Billy Joel, Whitney Houston, John Denver, Chet Atkins, Elton John, Jim Croce, and Harry Belafonte, among others. In 1971, a version by a group called The Nitty Gritty Dirt Band reached number 9 on the Billboard pop chart. These days, you're most likely to hear Mr. Bojangles performed in Sammy's style during a Rat Pack Tribute, where a performer will put on white gloves and a derby and offer a vocal, whistling, some tap dancing, and a lot of emotion. . .the way Sammy did it. To see Sammy performing Mr. Bojangles, visit this Rat Pack Tribute Page at YouTube. Three performers portray Frank Sinatra, Dean Martin and Sammy Davis Jr. They're known as Rat Pack Impersonators in a Rat Pack Tribute Show of music and comedy that's been seen in Los Angeles, Las Vegas and across the U.S.